Hello Everyone! I have been over on gearslutz for a while now and thought I would join the fun on PSW. Please feel free to ask any questions! New Custom built Mohog Mofet76 limiting amplifier. 1176 type compressor based off of the Revision F. Follow the link to check it out and to get all the details. These units Sound and look amazing. Great for any source including but not limited too Vocals, bass, snare and over heads/room mics. 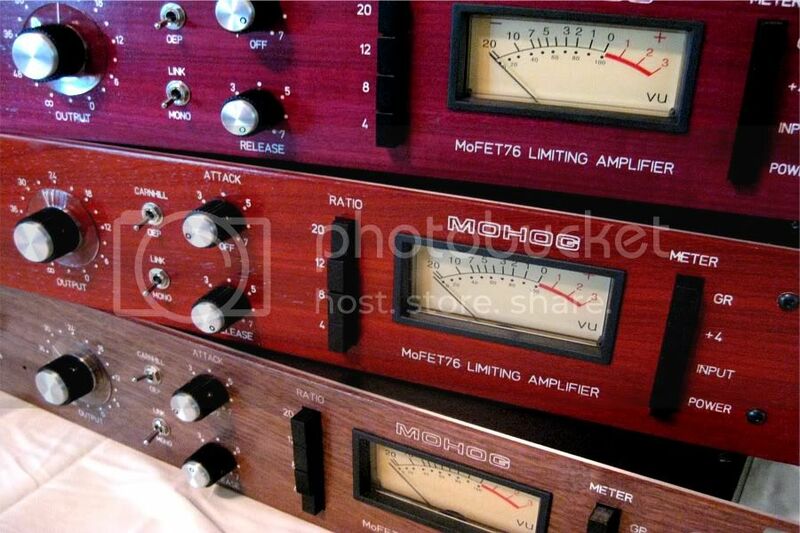 Get the sound of these classic compressors with a great unique look. Will ship world wide. Operates on 120v or 240V upon request. Seven Day Money Back Return Policy! Pick between four beautiful wood options. Great new features including switchable output transformers and input metering. Email with any questions. Thanks everyone! Can't you make one without wood on it? That's funny, but not such a silly request. If you imported one of these into Australia then technically you should declare it to Quarantine & they would inspect & possibly fumigate it at your cost (though most people probably wouldn't bother declaring it). Perhaps a laminate would be a better option... and reminiscent of 60's kitchen table kitsch. All the gear Mohog Audio will be making will have a wood faceplate. Please keep in mind the wood is 1/8" solid wood laminated to 2mm aluminum(all electronics are completely encased in metal). The lettering is infilled with white wax and the whole thing is finished with Lacquer. I would see not reason for any customs agancy to FUMIGATE the units. I have sent a dozen units to Europe and 6 out of those 12 times they were physically opened and inspected with no problems. Maybe Australia is different though. The wood will not obviously be for everyone, but it is something that Mohog will like to be known for. We are considering adding an etched copper plate. But that is in the trial stages and not a for sure option as of now. Thanks Guys! I hope everyone has a merry Christmas and a Happy Holidays!